This stunning three-wick candle is part of our intimate Black Magic range, featuring our original blend of warm vanilla combined with sensuous patchouli and relaxing lavender for an aroma that is as captivating as it is exciting. 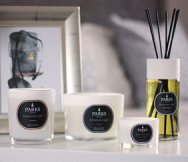 Finished with just a twist of lemon, this beautiful signature scent is infused in the purest natural wax candle for a sensational fragrance that will calm, relax and set the mood. Reminiscent of handmade ice cream or sumptuous fudge, the delectable smell of sweet vanilla instantly lifts the spirits and improves your mood. The warming aroma is so universally pleasing - familiar, comforting and loved by all ages. Vanilla is naturally reassuring, combatting anxieties and stress and helping to ease restlessness. When intimacy is the last thing on your mind, vanilla can help to melt away your worries so you can focus on your partner. The gorgeous musky aroma of patchouli is uplifting, banishing tensions and promoting excitement. Precious patchouli helps to clear your body and mind of anxiety, stress or sadness, while stimulating the release of pleasure hormones for a sensual experience. Known as a powerful attraction oil, patchouli can increase libido and sexual response. It has been used through the ages to relieve tension and has a relaxing, grounding effect. Lavender is better known for its calming properties. It is an effective healer and instils peace, helping you to let go. Its familiar fragrance soothes and helps to set the mood for passion. Finally, a hint of zesty lemon helps to clear your mind and aid focus. Expertly blended from essential oils in the purest natural wax, this sumptuous fragrance provides up to 80 hours of relaxation. Supplied in a luxury presentation gift box, this candle makes the perfect gift for busy couples who deserve a little quality time together.